Color can be intimidating - or so I’ve heard. From choosing the right ones that make you feel confident to trying to figure out what colors to wear together (hint: everything goes with denim! ), it can definitely scare some people into only wearing black. For as long as I can remember, I’ve always been one to run towards any and everything bold and bright. So pairing unlikely color combinations is something that comes easily to me. 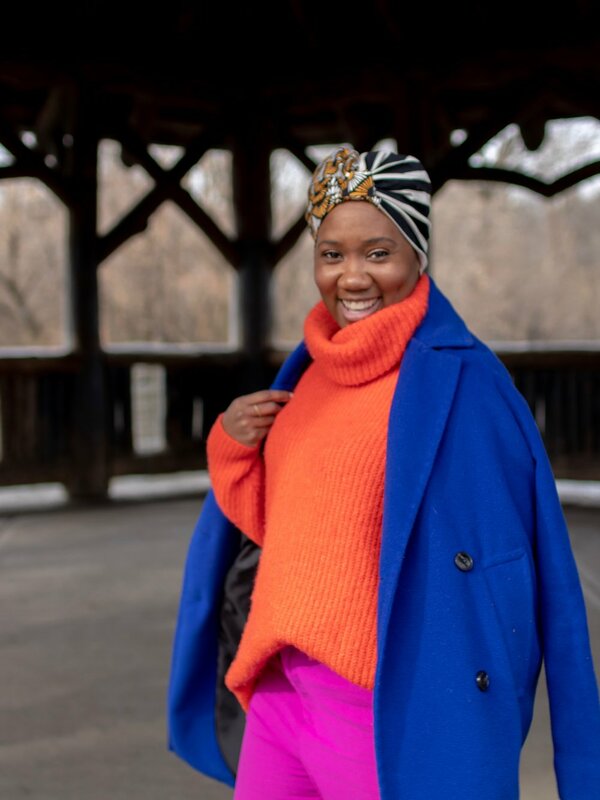 I’m realizing that not everyone has a knack for it, so I’ll be sharing some easy (and hopefully not intimidating) ways to add more color to your wardrobe. Wear classic styles. There are some pieces that will always be in style, no matter what. Can you think of a winter where people weren’t wearing turtlenecks? Me either. 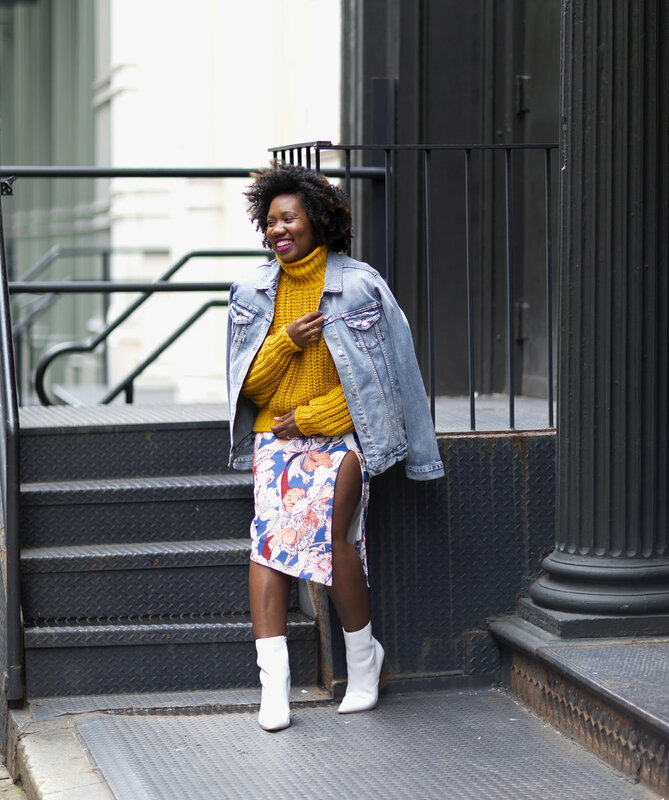 If you’re in a cold weather city, turtlenecks are a staple and come out of the closet every Fall. 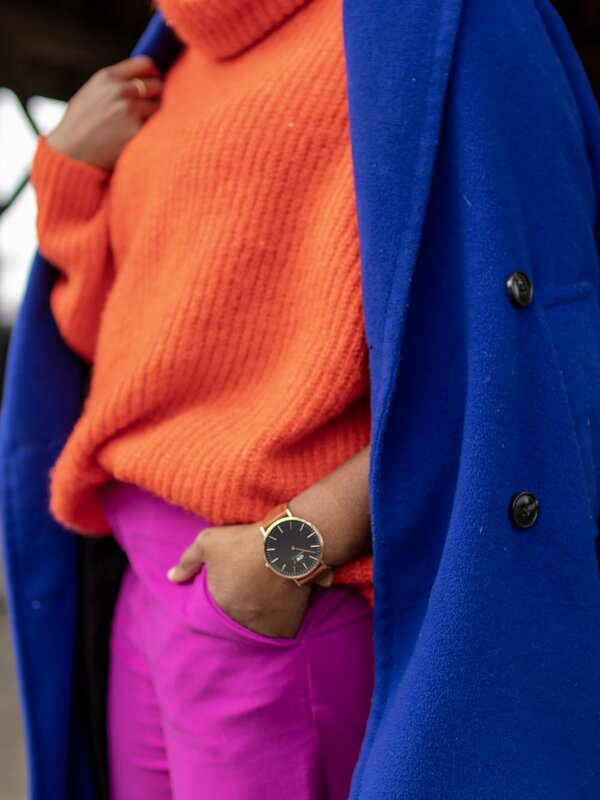 Try finding a bright orange (like this one) or bubblegum pink (like this one). You can pair a turtleneck with everything in your closet - from a pair of denim to wearing it over a dress. Wear a bold classic style. 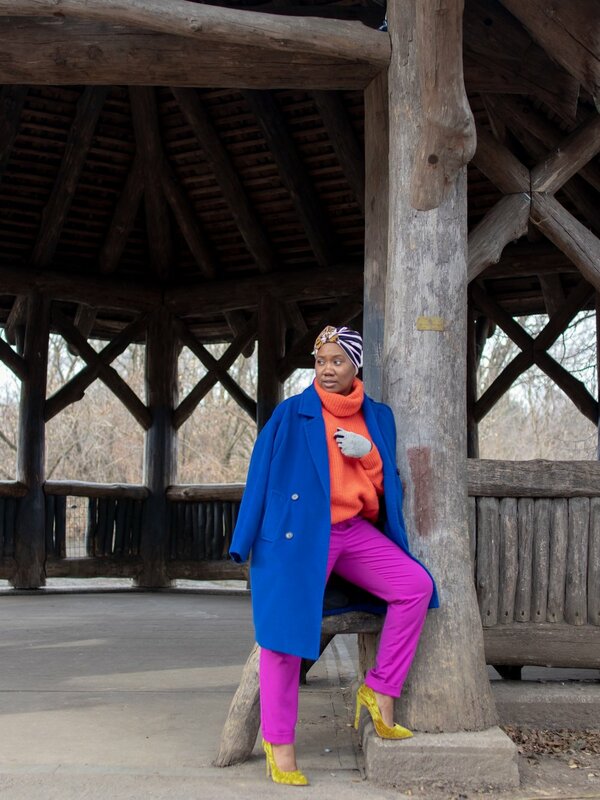 I wore this classic turtleneck in a vibrant marigold, over a dress to winterize one of my favorite summer pieces. 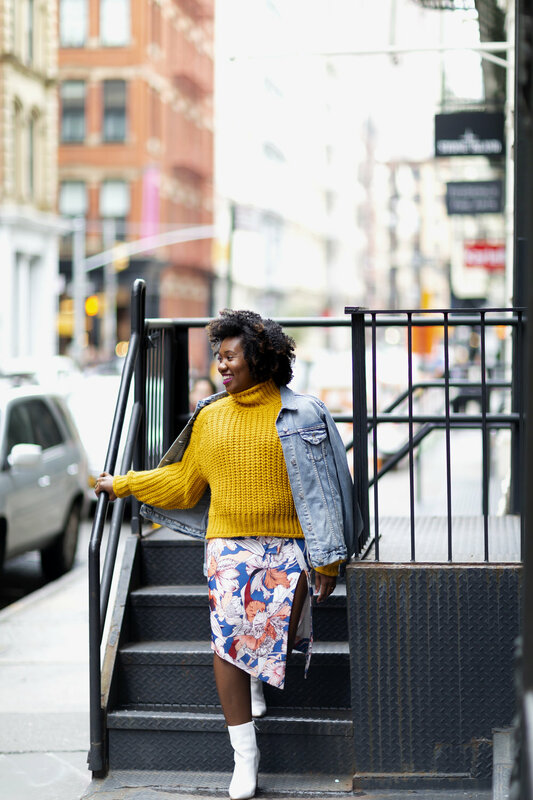 This dress is sleeveless with a low v-neck (definitely not suitable for Fall/Winter in NYC), so adding a sweater and denim jacket made it easy to wear as the temps got cooler. 2. 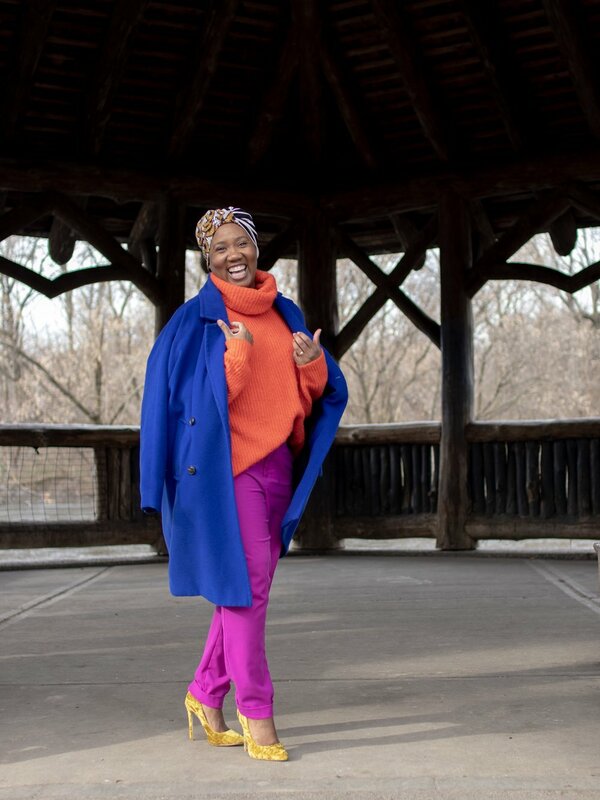 Wear bold colored outerwear. The great thing about coats (in most cases, but you know I’m extra) is that you don’t have to worry about putting a whole outfit together to match your coat. 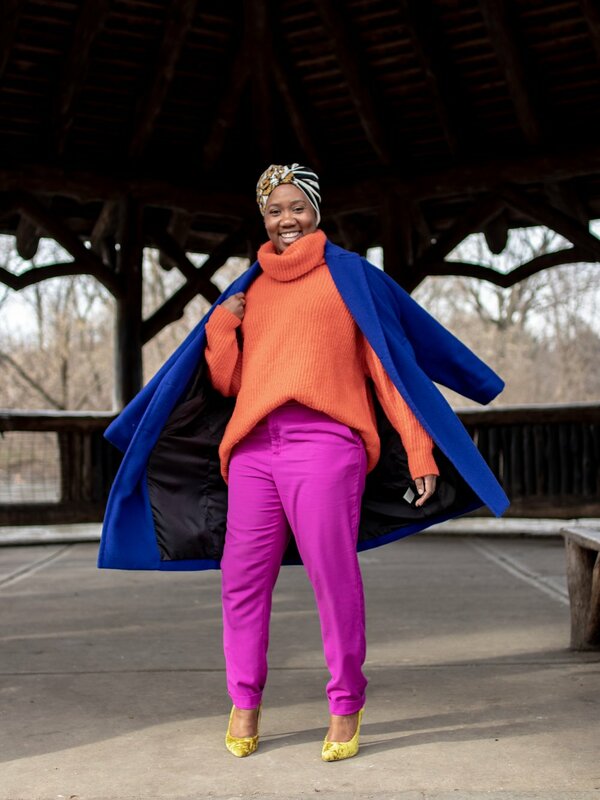 If you’re *not* like me, and actually plan on CLOSING your coat, then it doesn’t matter what colors you’re wearing underneath, because your outwear will do all the talking. This cobalt blue coat from J.O.A. (a brand I also carry in my shop) is a showstopper! Wear a bold statement coat. Adding a statement coat can bring any outfit to life! Although this look already had a lot going on, adding the blue coat gave it the extra edge. 3. Wear a bold shoe. Y’all know I LOVE a good shoe! Add any color (and I’m not talking black or brown) to your look and it’s an instant LEWK, honey. Shoes can take an outfit from blah to YAAAASSS, b*%^c in a matter of seconds. Whether it’s a bold yellow pump like this one or a red one like the one below, try adding an extra pop of color this way. 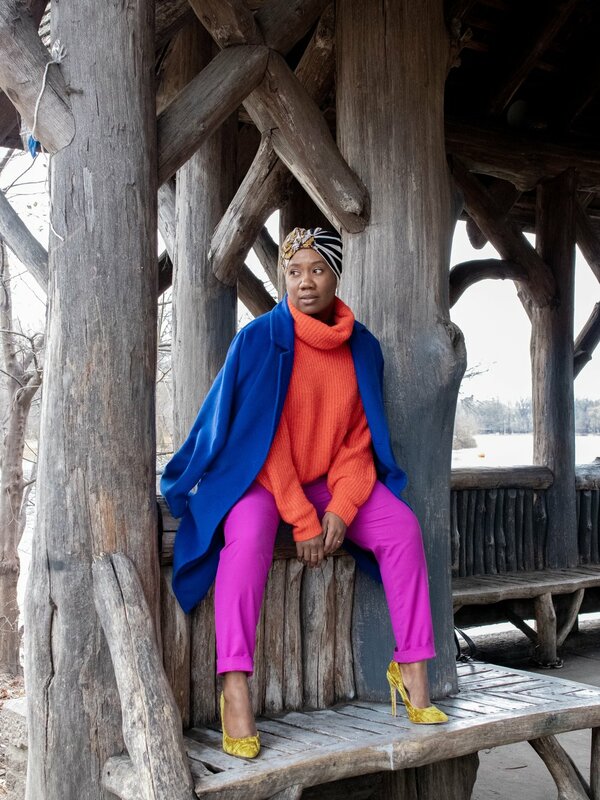 Adding a pop of color on your feet is a super easy way to infuse more color into your outfits. 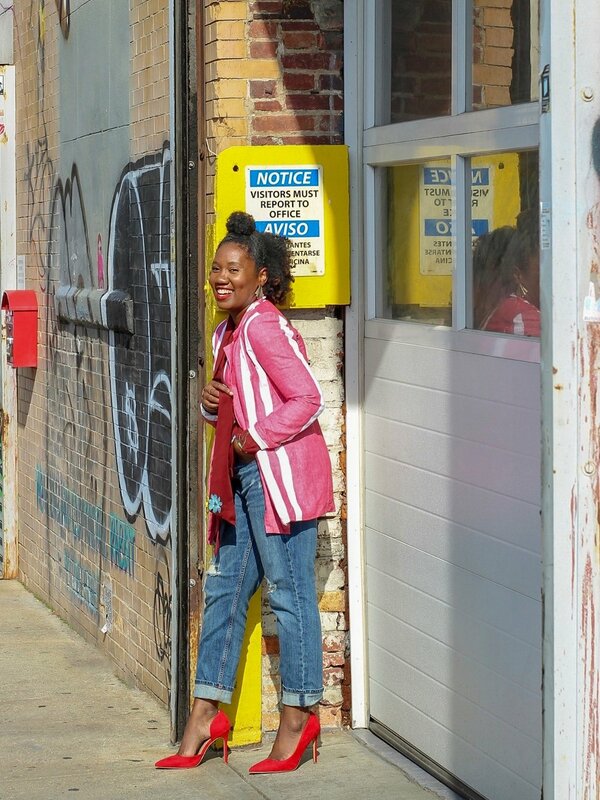 Even if it’s a colorful pair of sneakers - no need to wear heels to be fly! Et voila! Those are my tips for taking baby steps to add a little color to your wardrobe. Let me know what you think in the comments, and when you try one (or all if you’re feeling super adventurous!) of the tips, be sure to let me know over on Instagram!